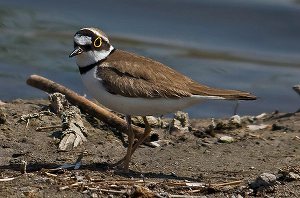 The Little Ringed Plover used to be a very rare vagrant to the UK however numbers have increased dramatically in recent years and there are now around 1200 pair breeding in the South East of England. Little Ringed Plover in summer plumage. 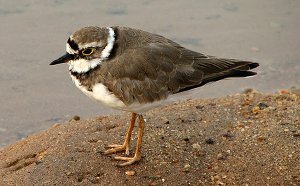 Note the bright orange Eye ring, dark bill and dull legs distinguishing this bird from a Ringed Plover. 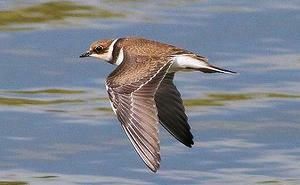 The Little Ringed Plover has a plain brown back in flight with no white wing bars or markings. Note the dark bill and yellow eye ring. In winter the birds black markings are much duller, however the yellow eye ring is still retained. The Juvenile birds breast band does not meet in the middle and it's head is plain brown. The lack of white stripe above the eye separates it from a Juvenile Ringed Plover. Also note the scaly appearance of the birds back and wings. 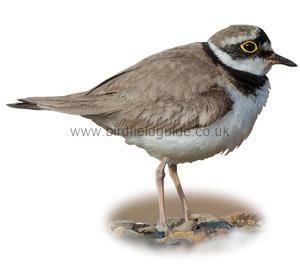 The Little Ringed Plover has a sandy-brown back, white underside, black breast band and a bright yellow eye ring. 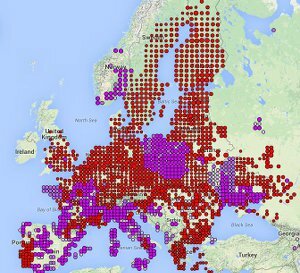 A widespread Summer visitor to most of Europe except the far North. In the UK it is is found mainly in the South East of England. Breeds on sand and shingle banks near beaches or inland water but can also be found around mines and derelict ground. 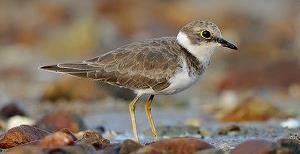 On migration it can be found on estuary mudflats.